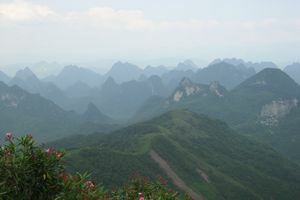 to include Yao Mountain in your trip, customize tour to following itinerary: Day 1: Be met at the airport and transferred to your hotel, after a short break, then visit Elephant Hill and Reed Flute Cave. ( Chinese lunch) Elephant Hill is situated in the confluence of Li River and Peach River, is the symbol of Guilin, the full moon of the hill looks like elephant' s trunk drinking water on Li River. Reed Flute Cave is reputed as " the art palace of the nature" where you can see beautiful stalactites, stalagmites, stone pillars, stone flowers with various shape, all glistening in colorful lights which create breathtaking splendor. Day 2: Li River Cruise Guilin-Yangshuo-Guilin (Breakfast and Chinese lunch) Be met from your hotel at about 8 am and transferred to Zhujiang pier at about 9 am. Li River cruise (4 hours) to Yangshuo with lunch on board, you will feast your eyes with the most beautiful limestone Karst towering pinnacles, clear water, rice fields, farms and villages with water buffalos, cows wondering around on both sides of the river bank. Disembark at the one-thousand-year-old town Yangshuo at about 2 pm and walking in the West Street for around half hour. The West Street is oldest street in Yangshuo with over 1400 years, it is located at the center of Yangshuo, became famous since 1980's. Transfer back to your hotel in Guilin. Day 3: Yao Mountain and Tea Plantation (Breakfast and Chinese lunch) Yao Mount 12 km from downtown is the highest hill of Guilin, to the summit by cable car to get a gorgeous view of the countryside and downtown, there is a tea plantation near Yao Mount. Tea Plantation Visit the tea plantation with green tea, Osmanthus tea, black tea, Wulong tea, jasmine tea, and you can also taste various kinds of tea here, the tea expert will give a good kownledge for the tea culture of China. Quotation per person in US Dollars. 1 person	2-5 persons	6-9 persons	over 9 persons Exclusive hotel	319,	250,	199,	173 5 star hotel	568,	385,	330,	299 4 star hotel	488,	325,	266,	239 3 star hotel	429,	285,	248,	219 Hotel names: Guilin Sheraton Hotel 5* Guilin Bravo Hotel 4* Guilin Osmanthus Hotel 3*..